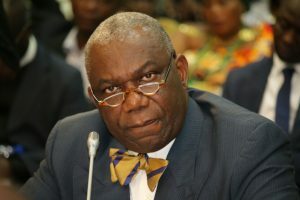 Energy Minister Mr Boakye Agyarko has affirmed the Government’s resolve to overhaul the country’s ailing energy sector to meet consumers demand for improved economic performance. “This government’s vision for the provision of state reliable and secure power supply also include initiatives such as restructuring of debts of the utility companies and securing fair commitment for a reliable supply of fuel,” he said. Ghana GRID Company and Electricity Company of Ghana provided counterpart funding for the multimillion project, which seeks to address unstable power supply to the nation’s capital. The Japanese Government gave around $40 million for the project, expected to be completed in the next 18 months. The Minister urged GRIDCO and ECG to work closely with constructors and consultants to ensure the project was completed on time. Electricity demand in Ghana continues to grow roughly by 10 per cent annually. The project is, therefore, seen as an important intervention to enable the supply of energy consumers need meet to meet their electricity demand. He said the Government was also working to increase the amount of renewable energy in the national grid. Mr Koji Makino, the Chief representative of JICA Ghana office, said the on December 8, 2015, JICA signed a grant agreement with Ghana for project for the Reinforcement of power supply to Accra Central, with Ghana Grid Company Limited (GRIDCo) as the implementing agency. He said of the important pillars of JICA’s cooperation in Ghana was infrastructure development, especially in the power sector in order to promote and sustain economic growth and reduce poverty. “As Ghana’s economy grows and power demand increases, there is the need for improvement of the network systems, especially in the transmission and distribution systems,” he said. “The recent energy crisis stimulated an increase in power generation, which requires corresponding improvement in the system network,” he added. He noted that while Ghana was taking measures to increase its generation capacity, it was equally vital to expand and improve the power transmission and distribution systems to accommodate the load and efficiently supply power. It is expected that on completion, electricity consumers in Accra Central and GRIDCO would directly reap the benefits of the project. This is because, the Achimota, Mallam, Accra East, New Tema and smelter II substations have been overloaded for far too long, serving Accra and its suburbs, which extend to as far as the Akwapim mountains and a little beyond. Mr Amuna said as a result, consumers experienced low voltages and unreliable power supply, whilst GRIDCo incurred very high transmission losses. “An outage at the Achimota substation, for instances, results in black out in many areas in Accra and beyond, this will soon be a thing of the past,” he explained.